There were a few Resident Evil titles on the floor this year. Mercenaries represented a new spin on the action elements we've been seeing in the most recent installments of the series. Operation Raccoon City is a departure into multiplayer territory, pitting the player against both zombies and the heroes we've all been in the past. Resident Evil: Revelations is a breath of fresh air for the old school fans of the series. The series before the massive redesign Leon brought boldly with him into Resident Evil 4. The thing that I loved the most about RE4 were the controls. No longer did I find myself running into each of the four walls in every room. The camera actually showed me all of the things I needed to see. Aiming and firing were intuitive and clean. The thing I missed the most from the Resident Evils before was the terror. The claustrophobic mansion hallways, basements, sewers and courtyards. The sure and shivery knowledge that nowhere was safe. The knowing that I had three friggin' bullets left and no idea where I'd be getting any more. Resident Evil: Revelations not only brings back that fear, that closed-in anxiety, but it incorporates those seamless controls. The floor demo begins with our old friend Jill Valentine waking up and finding herself in a room with no idea where she is, or how she got there. In a cursory search of her environment she finds a locked door, with a simple puzzle, requiring you to thoroughly check your environment for the tools you'll need to solve it. As soon as you do, an armoire behind you that had been jammed shut, bursts open and out comes your first deformed nightmare. Shoulder button to aim, face button to shoot, analog stick to back the heck up. 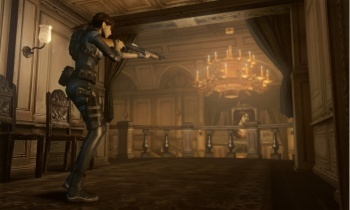 Proceeding through the door, you'll note that the rooms are very reminiscent of the mansion in the early games. Dim lighting, lots of reds and browns. Fancy furniture. Nooks and crannies where horrible things will hide. The creatures that I consistently ran into were gray with tongues like sea cucumbers. Creepy. They looked a little like Lickers, but I don't know, slippery...er. The feeling of danger was persistent as the the quantity of creatures grew. The touch screen portion of the DS contains your map and inventory. It showed me clearly and often that my supply of ammunition was sparse, which made me feel all nostalgic and whatnot. The map was pretty standard, rooms were either dark or light depending on whether or not you'd been in them, and doorways changed color once you used them. The aforementioned puzzle was solved using your stylus like a screw driver to some screws on a panel to reveal a faulty wiring problem inside that you fixed , again using the touch screen. I was skeptical about a full, story-based Resident Evil title on a handheld, but it looked lovely, and the controls seemed simple and effective. I can't wait to play this game late at night with all the lights on. Resident Evil: Revelations is coming out in 2012 for the Nintendo 3DS, and you can play it early if you pick up a copy of Resident Evil Mercenaries which will be bundled with a demo. Wahoo!